April 2004 (San Diego)--More than 400 people from throughout San Diego and East County attended the 48th annual Children’s Ball. Held at the U.S. Grant Hotel in downtown San Diego, this elegant gathering benefitted the Boys and Girls Clubs of East County. This year, the event honored Mary Alice and Ron Brady (photo, right), founders of the Brady Companies which recently donated $3 million to the Boys and Girls Clubs of East County. A new Brady Family Clubhouse on the campus of La Mesa Middle School will be named in their honor. The Boys and Girls Clubs of East County serve over 3,000 children every year. Attendees at this year’s Children’s Ball included elected officials representing East County, notably State Senator Joel Anderson (photo, right) and La Mesa Mayor Art Madrid (photo, left). 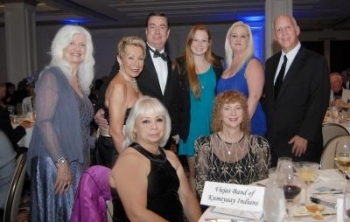 Native American tribal representatives from Viejas, Sycuan and Barona were also present, with Viejas cosponsoring the event at the U.S. Grant Hotel owned by the Sycuan tribe. Also present were leaders of the Chaldean community in East County such as Noori Barka and his family (photo, below left), La Mesa Chamber of Commerce President Mary England (photo, below right, with Ron Brady and Grove Pastry Shop owner Teresa Johnson, Boys and Girls Clubs major supporters Conrad Prebys and Debra Turner, Sharp Grossmont Hospital representatives, prominent developer Daryl Priest, and many other local luminaries. Guests bid on silent auction prizes including a Hawaii vacation, $1,000 cash and tickets to a Lady Gaga concert. Opportunity drawing tickets were also available for an array of prizes—all to help expand and improve facilities for children in need across East County.